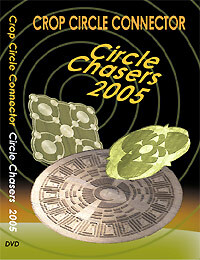 None of us could have predicted the extraordinary events that took place within the 2005 crop circle season. This year the continuing link between ancient sites and crop circle locations grew ever stronger, with an amazing connection to an ancient cultures time calendar. As the season drew to an end, the phenomenon took a greater step into this unfolding mystery towards an end to a time frame only 7 years away! However the season started in a fresh and evocative style, with many outstanding formations flying onto our landscape, with awe-inspiring geometry and proportions. It clearly established that this enigmatic phenomenon is here for a while yet! As the season drew to an end, the phenomenon took a greater step into this unfolding mystery towards an end to a time frame only 7 years away! A 25 minute video, now with narration, which was shown at the Glastonbury Symposium UK 2000. Jaime Maussan, the well known ufologist, makes a special visit to the remarkable Wayland Smithy formation, resulting in astonishing findings encoded within the design. The DVD-R disk is compatible with most domestic consumer DVD Players and Computer based DVD-R ROMS, check this link. before buying. Enter your DVD model and click the DVD-R Box to see compatibility. Postage and shipping included. Also VAT.